ADB, through the Energy for All Initiative, supported the development of ROMELCO’s 30-kW solar diesel hybrid power that provides round-the-clock electricity to 244 households, a health center, a school, and local industries in Cobrador Island, a remote island in Romblon province. In addition to providing pre-development technical assistance, ADB endowed the project with a USD100,000 grant to demonstrate the technological viability of a solar-diesel mini-grid in the Philippines. Prior to this solar-diesel hybrid project, Romblon Electric Cooperative (ROMELCO) can only serve 110 households for 8 hours a day using diesel generator sets. The high cost of diesel, the associated fuel transportation costs, and insufficient capacity of the gen sets prevented ROMELCO to serve all potential consumers in the island. While a few households own solar home systems, majority relied on kerosene for lighting. The local marble and tourism industries were impeded by the unreliable supply of electricity. ROMELCO’s solar - diesel hybrid project is a sustainable solution to the island’s power supply deficit problem. The pilot facility is composed of a 30 kW solar photovoltaic system, 180 kWh lithium - ion batteries to store excess generation for night - time use, and a 15 kW diesel generator. The hybrid facility enabled ROMELCO to provide 24/7 electricity services to all households, serve local industries and community centers, and has reduced thier power generation costs. An estimated 64.8 tons of carbon emissions is projected to be avoided per year as a result of lower fossil fuel consumption. Moreover, the reliable electricity services will contribute in the growth of local industries, improve social services, and enhance the quality of people’s lives. What problem are you trying to solve? Who has this problem? The archipelagic characteristic of the Philippines is the biggest challenge to meet the country’s rural electrification goals. Over 1.8 million households (as of Aug 2016) are still without access to electricity service. The remoteness of many areas, especially small islands scattered within the archipelago, makes it impossible for all potential consumers to be connected to the main electricity grid. RE – diesel hybrids present a viable option for electric cooperatives to serve unelectrified communities in their coverage areas. Prior to the project, ROMELCO can only provide electricity services to 110 households in Cobrador Island for 8 hours per day. More than half of the households remain unelectrified, others use solar home systems, and majority uses kerosene as their primary energy source. ROMELCO needed to find a sustainable solution that will allow them to serve all the households as well as the budding tourism industry in the island. 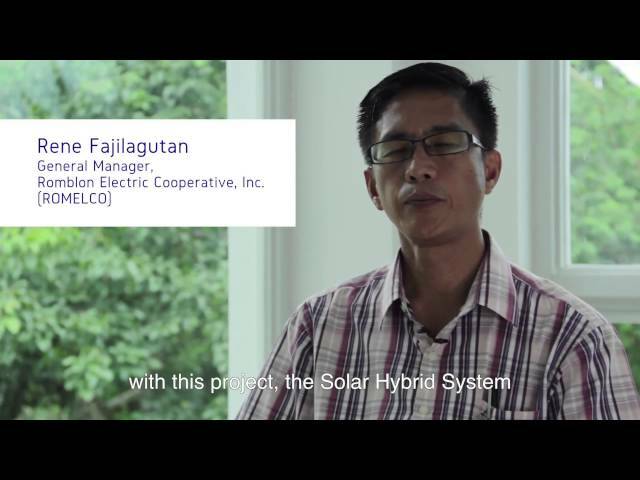 ROMELCO, with the support from ADB, KEA, and NEA developed a solar - diesel hybrid mini-grid in Cobrador Island, Romblon. ROMELCO, an electricity distribution cooperative, not only distributes power but operates and maintains the RE hybrid power generation facility. The project will reduce power supply costs for ROMELCO, increase electricity service from 8 hours to 24 hours, and provide sufficient power for productive uses and income generating activities. Diesel generation facilities may be retrofitted or hybridized with renewable energy (RE) technologies based on the availability of the resources in the area. The PV hybrid system reduces ROMELCO's power supply costs, provides 24 hours electricity services to all households (from 110 to 224), and serves local industries and community centers. The project demonstrates that the solar - diesel hybrid system is an effective option for providing reliable electricity services to remote and isolated islands. During the day, the PV panels will supply the power requirements of the community and excess energy stored in batteries. At night, the system will first use battery - stored power before using the diesel generator to cover the load deficits at peak demand. ROMELCO leveraged on the expertise and support of KEA, ADB, and NEA to successfully develop its first RE-hybrid project and build its own technical capabilities. Showcasing the feasibility of a renewable energy hybrid system will encourage other electric cooperatives across the Philippines to hybridize their existing diesel gensets with renewable energy to provide 24-hours electricity service.